Note to self: When Courtney Fingar texts you on a Friday night and asks if you “fancy going to a Russian’s Karaoke-Birthday party in Notting Hill tomorrow?” – always say yes. That is precisely what I did. My reply was simple and concise: ‘Yes’. Why? I hear you ask, because you never know who you might meet. Just as the party was heating up, the barbecue was going and the wine flowing, a petite, blonde lady – carrying this gold, leather clutch bag tucked under her arm, began making a beeline for the door. As she was saying her goodbye’s the person I had been talking to could see my eyes were drawn to the bag she was holding. So much so, I had actually lost track of what I was saying. “Oh, go on!” my convo-buddy laughed as they conceded the battle for my attention had been lost to a gold clutch-bag. I walked up to the owner, shook her hand and the rest, as they say, is history! “I love London,” Riikka explained as she handed me my cup of coffee. “Raising children in London is so much fun because there is no fixed way to do anything. It’s… It’s…” Cosmopolitan? I can finish her sentence, because as the grandchild of West Indian immigrants, born and bred in North West London, I know only too well what she means. London is the city that just keeps on giving. Whatever the political party of the day, the fact remains, just as it would have been at the turn of the 16th century, London attracts all sorts from all corners of the globe. Artisans, musicians, traders, diplomats, writers and academics: London has long been a multicultural hub. As a city, it creates its own organic aesthetic. It was this, Riikka explains, that she wanted to capture in her latest collection for Taikka. Sat in front of me on the coffee table, was the gold clutch that had first caught my eye at the karaoke party. Beside it lay another, equally striking clutch bag. 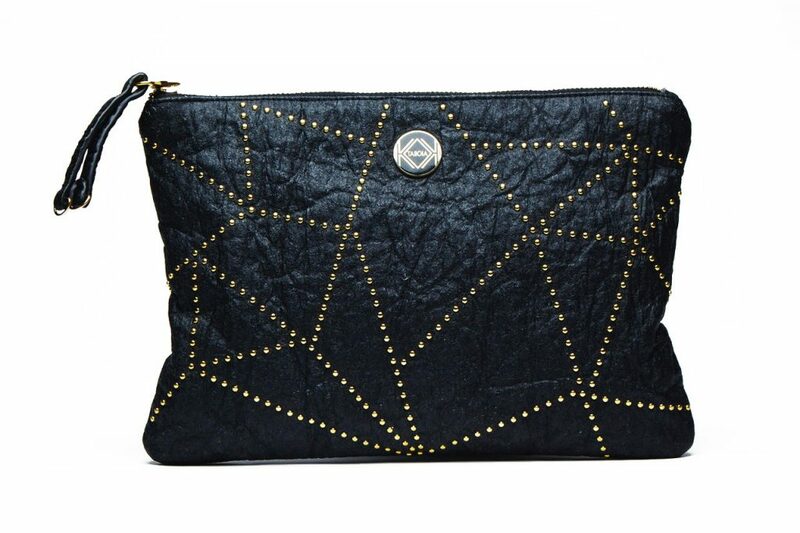 Black, distressed leather-like finish, with gold studs for the more subtle but equally edgy palette. There is no getting away from it, the sustainability aspect guarantees the sleepless nights will be kept at bay after purchase as you will rest safe in the knowledge that no one was harmed in the production of these eco-friendly accessories. But ethics aside, these are genuinely beautiful bags. To hold, to look at, to carry and to wear. While I do preach that Fashion needs to be ethical, it should also be fun. If these bags are anything – they are fun. Yes. We are back here again. As you know when I approach fashion, I never venture far from these two tangents when examining a product or looking at a concept. “Is it functional?” and “ Is it aesthetically pleasing?” are the first two questions I always ask. For those of you who arrived here via my article “Functionality vs The Aesthetic” you will be well versed in the @WorkInFashion.me manifesto that reverts back to the Latin for its definition of fashion. Taken from the Latin ‘Facere’ meaning to ‘do’ or to ‘make’ I am a firm believer that if the item in question is to qualify as being a part of ‘fashion’ – it must be made for a reason, it has to have a function and serve a purpose. So you can imagine my quiet satisfaction at hearing Riikka explain that her motive behind establishing Taikka stemmed from her desire to create a practical bag for women – that was both functional but also attractive. “Women have multiple roles. Work life, home life, Motherhood, business… I wanted to create something functional that could be carried into all spaces,” she explains. Looking down at the black clutch with the gold studs, eyeing up the various different night clubs, dinners, summer parties I could take it to, I could see clearly that she had achieved what she had set out to do. “A customer contacted me the other day to say thank you. She said she was able to put her i-pad inside the clutch, and could carry it into meetings with her. What had been bought as an accessory for an event – doubled as a mini briefcase for work. I was so happy to see it being used in this way.” Riikka beams as she watches me then take my own i-pad and test to see if it fits. Plenty of room. I looked down at my own briefcase, back at clutch and back at my briefcase again. If I could trade I would have done in an instant. The clutch bag had enough space for an i-pad, some make-up, a small umbrella and a lampshade. No ok. No lampshade, but even the au-pair who is famous for having the magic holdall would be impressed with this bag. Functionality covered, let’s get to the aesthetic. So, it’s not without reason that when you mention ‘eco-friendly’ a cynical eyebrow often raises itself in doubt. In so many cases designers have often had to compromise the aesthetic for the sake of sustainability. With Taikka that is a dilemma they will never have to worry about. Aside from looking like real leather – even when up close, their bags feel like real leather too. Another fun factor of fashion is not just the visual joy at the aesthetic harmony – it’s also the feel. Texture plays a big part in why people invest in fashion. They like the way an item makes them feel. This is important. The senses stir emotions. Almost like a drug, if something feels good, it triggers a chemical in the brain that makes us happy. Cashmere, Velvet, Leather… all affordable substitutes for a simple high. In this instance, the Pinatex technology used to manufacture these bags, has an equally comforting feel. You will find yourself stroking it. It compels you to. 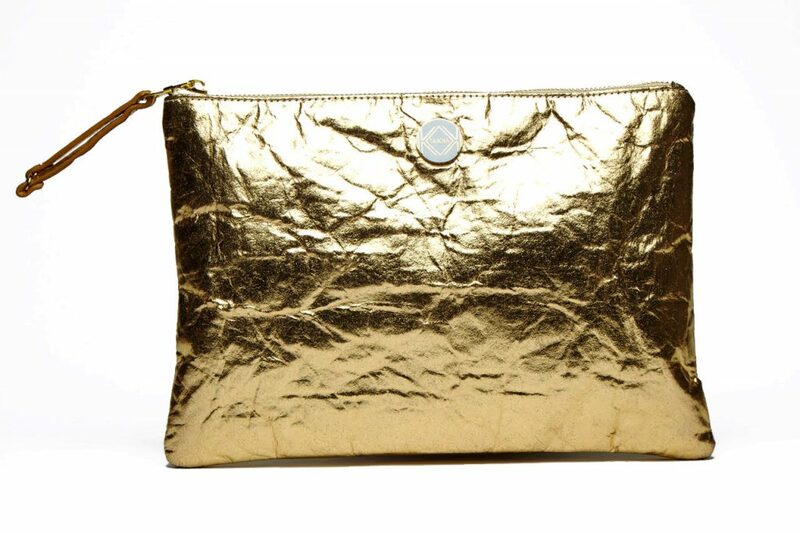 The bag with the gold finish in particular, toys with the imagination as you know it is not leather but its smooth, waxy soft texture gives way in the same way that expensive leather does. What else? Oh the brand. So, as I mentioned earlier the founder, Riikka is the heartbeat of this brand. Her energy is woven into every seam. As she recounts her numerous heated conversations with various factory owners in discussing the importance of precision, quality assurance and a reduction of waste, when manufacturing her products, her customers appreciate her attention to detail. But she does not act alone. 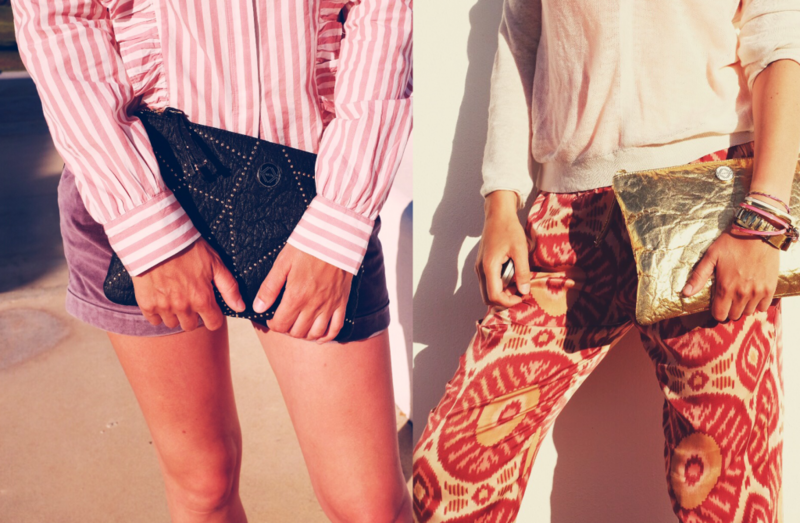 The brand is a joint venture between Riikka and her close friend Mia who is based in Australia. Like the city from which the idea sprung, this is a brand that is built on diversity. Riikka’s Finnish roots champion sustainability, consumer and manufacturing consciousness, but at the same time, the bags themselves feel like they belong to warmer climes. Both features ensure that the Taikka bags will blend in beautifully on any London high street: whether it be Shoreditch or Sloane Street. “I throw the ball, but Mia catches it, she runs with it, and she helps to make the idea ‘happen’ – the only person I know who can do that” Riikka muses. The chemistry between the two women is manifest in the product itself. What started out as an idea, turned into an experiment, found its way into a conversation at the school gates and boom! Taikka was born. It’s not hard to see why Taikka attracts so much interest wherever it goes. It is made from pineapple skins – but from pineapples that were not grown for manufacture, but are a bi-product of the existing agricultural trade in fruit. Riikka informs me that approximately 21 million tonnes of pineapple skin is wasted every year – the Pinatex is a bi-product of this waste. Produced in the Philippines, the world’s largest pineapple producer, no over-farming is necessary, the soil is not exhausted to satisfy a couture-fiend’s habit. Being made from natural substances – means it is biodegradable. It will return to the soil from whence it came – free from toxins, evil dyes and poisonous glues. Friendship is a beautiful thing. So is the symphony that is created when it is combined with an ethical vision. Affordable, fairtrade, fun, functional and beautiful – I could talk to you about Taikka bags all day. But I won’t. The moral of the story is this:- always say yes to karaoke parties and don’t be afraid to try something new. Check out the new range of Taikka bags now. Visit the WorkinFashion//Store to purchase the bags. I just want to mention I am just new to blogging and honestly liked this web blog. Probably I’m planning to bookmark your blog . You definitely have impressive articles and reviews. Cheers for revealing your web-site. My spouse and i felt so fortunate Jordan managed to do his studies through the precious recommendations he had through the blog. It’s not at all simplistic to simply be giving for free tips and tricks that others may have been selling. And we also know we need the writer to appreciate for this. Those illustrations you made, the simple website navigation, the relationships your site help to instill – it’s got all excellent, and it’s really making our son in addition to the family recognize that this subject is awesome, and that is highly indispensable. Thanks for all the pieces! Gday here, just started to be receptive to your webpage through Search engine, and realized that it is truly entertaining. I will appreciate if you decide to continue this idea. Whats Happening i am new to this, I stumbled upon this I have discovered It absolutely helpful and it has helped me out loads. I hope to contribute & help other customers like its helped me. Good job. Thanks for sharing excellent informations. Your web site is so cool. I’m impressed by the details that you¡¦ve on this site. It reveals how nicely you perceive this subject. Bookmarked this website page, will come back for extra articles. You, my pal, ROCK! I found simply the info I already searched all over the place and simply couldn’t come across. What a perfect website. I have been absent for some time, but now I remember why I used to love this website. Thanks , Iâ€™ll try and check back more frequently. How frequently you update your web site? Hi there, I discovered your site by way of Google while looking for a comparable topic, your website got here up, it appears to be like great. I have bookmarked it in my google bookmarks. I must show my appreciation to this writer just for rescuing me from such a instance. Because of surfing around throughout the the web and coming across views which are not helpful, I assumed my entire life was well over. Living devoid of the approaches to the problems you have fixed all through your article is a critical case, as well as the ones which may have in a wrong way affected my entire career if I had not noticed your site. That competence and kindness in dealing with almost everything was precious. I’m not sure what I would’ve done if I hadn’t encountered such a subject like this. I can now look ahead to my future. Thank you very much for your expert and amazing guide. I will not be reluctant to recommend your site to any individual who desires guidance about this matter. Magnificent web site. A lot of useful information here. I’m sending it to a few friends ans also sharing in delicious. And obviously, thank you to your effort! you are in point of fact a just right webmaster. The web site loading velocity is amazing. It kind of feels that you are doing any distinctive trick. Furthermore, The contents are masterwork. you’ve done a wonderful activity in this subject! I think this website has some rattling excellent info for everyone :D. “The ground that a good man treads is hallowed.” by Johann von Goethe. I must show my passion for your kind-heartedness for folks that really need assistance with the concern. Your very own commitment to passing the message around was certainly informative and have always enabled those like me to realize their ambitions. This important recommendations denotes a lot to me and additionally to my office workers. Thanks a lot; from all of us. My spouse and i ended up being really thrilled when Albert managed to finish off his inquiry with the ideas he grabbed from your own weblog. It is now and again perplexing to just choose to be giving for free guides that other folks may have been making money from. We already know we need you to be grateful to for this. Most of the explanations you made, the simple website navigation, the friendships you will make it possible to instill – it’s got all powerful, and it’s leading our son in addition to the family feel that that situation is satisfying, and that’s extremely serious. Many thanks for all! I together with my pals were actually looking at the great guides on the website and then immediately I got an awful suspicion I never thanked the web site owner for those tips. My women were so warmed to learn them and now have in actuality been making the most of those things. I appreciate you for actually being quite accommodating and for utilizing such quality areas most people are really needing to know about. My very own honest regret for not saying thanks to sooner. No it is not ok use my ideas. 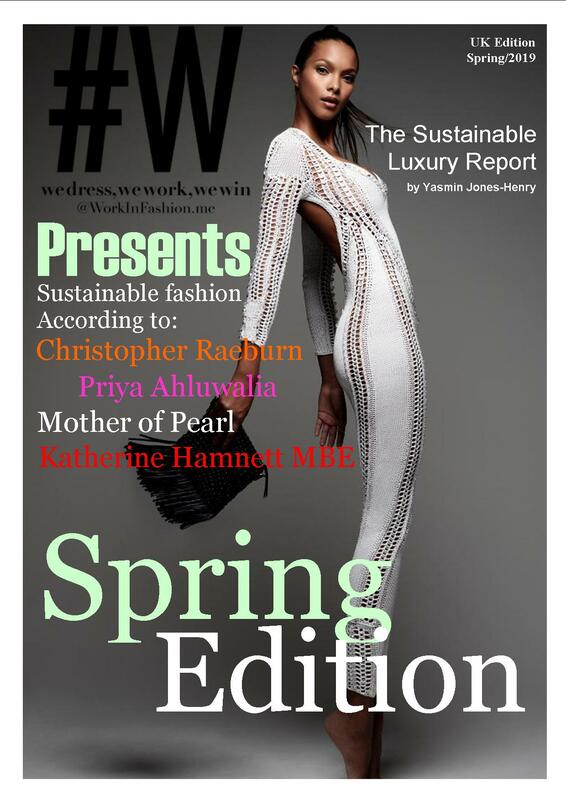 All of the intellectual property on https://www.workinfashion.me (design and editorial content) is subject to the copyright of Urban Flow Designs LTD. I have never visited your website. I do not know you – any attempt to steal my ideas will result in legal action. I do believe all of the ideas you have introduced to your post. They are very convincing and can certainly work. Nonetheless, the posts are very quick for novices. Could you please lengthen them a little from subsequent time? Thanks for the post. It’s perfect time to make some plans for the future and it is time to be happy. I’ve read this post and if I could I want to suggest you few interesting things or advice. Maybe you could write next articles referring to this article. I wish to read even more things about it! Good day very nice blog!! Guy .. Excellent .. Amazing .. I will bookmark your site and take the feeds additionally¡KI’m happy to find numerous helpful info right here within the publish, we’d like develop extra techniques in this regard, thank you for sharing. . . . . . Thanks for any other informative website. The place else may just I am getting that kind of information written in such an ideal manner? I have a undertaking that I’m just now operating on, and I have been at the glance out for such info. Wow, amazing weblog structure! How long have you been running a blog for? you made blogging glance easy. The entire glance of your web site is great, as smartly as the content material! I just couldn’t go away your web site prior to suggesting that I extremely enjoyed the usual information an individual supply to your guests? Is gonna be again ceaselessly in order to check up on new posts. You are my inhalation , I own few web logs and very sporadically run out from to brand.I believe this website has got some very wonderful information for everyone. Normally I don’t learn article on blogs, but I would like to say that this write-up very forced me to take a look at and do it! Your writing taste has been amazed me. Thank you, quite nice article. Some really great information, Glad I discovered this. “Men in no way approach so nearly to the gods as in doing good to men.” by Marcus Tullius Cicero. Real nice design and style and superb subject material , practically nothing else we want : D.
I really enjoy reading on this site, it has good articles . “He who sees the truth, let him proclaim it, without asking who is for it or who is against it.” by Henry George. Great – I should certainly pronounce, impressed with your web site. I had no trouble navigating through all tabs and related information ended up being truly simple to do to access. I recently found what I hoped for before you know it at all. Reasonably unusual. Is likely to appreciate it for those who add forums or anything, site theme . a tones way for your client to communicate. Nice task. Simply want to say your article is as amazing. The clarity in your post is simply excellent and i could assume you are an expert on this subject. Well with your permission allow me to grab your feed to keep updated with forthcoming post. Thanks a million and please continue the enjoyable work. you are in point of fact a good webmaster. The website loading pace is amazing. It sort of feels that you are doing any distinctive trick. Moreover, The contents are masterwork. you have done a magnificent task on this topic! I am just commenting to let you understand of the useful encounter our daughter found browsing your webblog. She discovered so many details, which included how it is like to have a very effective giving nature to have certain people smoothly thoroughly grasp specific multifaceted subject matter. You really exceeded my desires. Thank you for displaying such helpful, healthy, edifying not to mention fun thoughts on your topic to Julie. Hiya, I am really glad I’ve found this info. Today bloggers publish only about gossips and internet and this is really frustrating. A good web site with interesting content, this is what I need. Thanks for keeping this web-site, I will be visiting it. Do you do newsletters? Cant find it. You can definitely see your expertise in the paintings you write. The world hopes for even more passionate writers like you who aren’t afraid to say how they believe. Always go after your heart. “Experience is a good school, but the fees are high.” by Heinrich Heine. fantastic submit, very informative. I’m wondering why the opposite specialists of this sector do not understand this. You must proceed your writing. I’m sure, you’ve a huge readers’ base already! Rattling superb info can be found on website . “Search others for their virtues, thyself for thy vices.” by Benjamin Franklin. Someone essentially assist to make significantly posts I’d state. That is the first time I frequented your web page and thus far? I surprised with the analysis you made to create this actual post incredible. Wonderful activity! It¡¦s in point of fact a great and useful piece of info. I am happy that you simply shared this helpful information with us. Please stay us informed like this. Thank you for sharing. I do agree with all the concepts you have presented to your post. They are really convincing and will definitely work. Nonetheless, the posts are very short for starters. May you please prolong them a bit from next time? Thank you for the post. I like this website very much, Its a very nice position to read and find info . “What is called genius is the abundance of life and health.” by Henry David Thoreau. I do agree with all of the ideas you’ve introduced for your post. They are really convincing and can certainly work. Nonetheless, the posts are very short for starters. May just you please prolong them a little from subsequent time? Thanks for the post. Attractive part of content. I just stumbled upon your blog and in accession capital to say that I get in fact loved account your blog posts. Anyway Iâ€™ll be subscribing for your augment or even I achievement you get right of entry to constantly fast. I conceive this site holds some really great information for everyone :D. “I like work it fascinates me. I can sit and look at it for hours.” by Jerome K. Jerome. I like this blog very much, Its a rattling nice place to read and incur information. “Nunc scio quit sit amor.” by Virgil. Keep up the fantastic work , I read few posts on this website and I think that your weblog is real interesting and has got bands of excellent information. Good – I should definitely pronounce, impressed with your site. I had no trouble navigating through all tabs and related info ended up being truly simple to do to access. I recently found what I hoped for before you know it in the least. Reasonably unusual. Is likely to appreciate it for those who add forums or anything, site theme . a tones way for your customer to communicate. Nice task. Great goods from you, man. I’ve understand your stuff previous to and you are just too great. I really like what you have acquired here, really like what you’re stating and the way in which you say it. You make it entertaining and you still care for to keep it wise. I can not wait to read far more from you. This is really a terrific web site. You actually make it seem really easy with your presentation but I in finding this matter to be actually one thing that I believe I’d by no means understand. It sort of feels too complex and extremely broad for me. I am taking a look forward for your next publish, I will attempt to get the hold of it! Hi there, I found your blog by means of Google whilst looking for a comparable topic, your website came up, it appears great. I have bookmarked it in my google bookmarks. Hello there, I found your site via Google at the same time as searching for a similar subject, your site came up, it seems good. I’ve bookmarked it in my google bookmarks. It is in reality a great and helpful piece of information. I¡¦m happy that you simply shared this useful information with us. Please keep us informed like this. Thank you for sharing. You completed some fine points there. I did a search on the subject and found mainly people will go along with with your blog. Thank you, I’ve recently been searching for info about this subject for a long time and yours is the greatest I’ve found out so far. However, what about the conclusion? Are you certain in regards to the supply? I have been surfing online more than three hours lately, but I by no means discovered any interesting article like yours. It¡¦s beautiful price sufficient for me. Personally, if all site owners and bloggers made excellent content material as you probably did, the internet will be much more helpful than ever before. Great tremendous issues here. I¡¦m very satisfied to peer your post. Thanks so much and i am looking forward to touch you. Will you please drop me a e-mail? I wish to show my love for your generosity supporting people that need help with your study. Your very own dedication to getting the solution all over ended up being extremely invaluable and has continually helped many people much like me to arrive at their endeavors. Your new informative guideline can mean a lot to me and extremely more to my fellow workers. Thank you; from everyone of us. It is actually a nice and helpful piece of info. I¡¦m satisfied that you just shared this helpful info with us. Please stay us up to date like this. Thank you for sharing. I’ll immediately seize your rss as I can’t in finding your e-mail subscription link or e-newsletter service. Do you have any? Please allow me realize so that I could subscribe. Thanks. My brother suggested I might like this blog. He was entirely right. This post truly made my day. You can’t imagine simply how much time I had spent for this information! Thanks! Good day very nice blog!! Guy .. Excellent .. Wonderful .. I’ll bookmark your website and take the feeds also¡KI am happy to seek out numerous helpful info here within the submit, we want work out more techniques in this regard, thank you for sharing. . . . . . I must point out my affection for your generosity in support of individuals that need help on in this theme. Your very own dedication to getting the message throughout became exceptionally advantageous and have consistently made guys and women like me to attain their ambitions. Your amazing important report implies a great deal a person like me and far more to my office colleagues. Best wishes; from each one of us. I was just looking for this info for some time. After 6 hours of continuous Googleing, finally I got it in your web site. I wonder what’s the lack of Google strategy that don’t rank this type of informative web sites in top of the list. Normally the top sites are full of garbage. I¡¦ll right away grasp your rss as I can’t to find your e-mail subscription link or e-newsletter service. Do you have any? Kindly allow me know so that I may just subscribe. Thanks. My spouse and i felt absolutely thrilled when Louis managed to deal with his homework through the entire precious recommendations he made when using the site. It is now and again perplexing to just find yourself handing out strategies that most people may have been trying to sell. And we also fully understand we now have the website owner to thank because of that. Those illustrations you made, the simple web site navigation, the relationships you make it easier to foster – it is everything wonderful, and it is helping our son and the family do think this concept is thrilling, which is pretty fundamental. Many thanks for everything! I was just searching for this information for some time. After 6 hours of continuous Googleing, at last I got it in your website. I wonder what is the lack of Google strategy that don’t rank this kind of informative web sites in top of the list. Generally the top web sites are full of garbage. I will right away take hold of your rss feed as I can not to find your e-mail subscription hyperlink or newsletter service. Do you’ve any? Please let me understand so that I may subscribe. Thanks. Hi there, I discovered your web site by means of Google at the same time as looking for a related topic, your website got here up, it appears to be like great. I have bookmarked it in my google bookmarks. you are truly a good webmaster. The web site loading velocity is incredible. It seems that you’re doing any distinctive trick. Furthermore, The contents are masterwork. you’ve done a magnificent process in this topic! Hiya, I’m really glad I’ve found this info. Nowadays bloggers publish only about gossips and net and this is actually frustrating. A good blog with interesting content, this is what I need. Thank you for keeping this web-site, I will be visiting it. Do you do newsletters? Can not find it. Just want to say your article is as astounding. The clarity in your post is just excellent and i can assume you’re an expert on this subject. Well with your permission let me to grab your feed to keep up to date with forthcoming post. Thanks a million and please keep up the rewarding work. I together with my friends were going through the good recommendations from the website while immediately I had a terrible suspicion I never expressed respect to the site owner for those secrets. The women ended up absolutely stimulated to learn them and have now pretty much been having fun with those things. I appreciate you for getting well thoughtful and for selecting certain fantastic things millions of individuals are really wanting to understand about. My personal sincere apologies for not expressing gratitude to you earlier. I and my pals were looking at the best recommendations found on your web site and then before long I had an awful suspicion I had not expressed respect to you for them. My men were for that reason joyful to study them and have clearly been loving those things. I appreciate you for getting well accommodating as well as for getting these kinds of brilliant subject areas millions of individuals are really desperate to know about. Our own honest regret for not expressing gratitude to you earlier. Simply want to say your article is as amazing. The clarity in your post is just nice and i can assume you are an expert on this subject. Fine with your permission allow me to grab your feed to keep up to date with forthcoming post. Thanks a million and please carry on the rewarding work. I as well as my friends were actually viewing the nice techniques found on your web page while all of a sudden I got an awful feeling I never thanked the web blog owner for those techniques. All the guys had been so excited to learn them and have in truth been having fun with them. Thanks for getting well helpful and then for settling on such high-quality useful guides most people are really desirous to be aware of. My very own sincere regret for not expressing gratitude to you earlier. Hi there, I discovered your web site via Google at the same time as searching for a related matter, your site came up, it seems great. I have bookmarked it in my google bookmarks. Just desire to say your article is as amazing. The clarity in your post is just cool and i could assume you are an expert on this subject. Fine with your permission allow me to grab your RSS feed to keep updated with forthcoming post. Thanks a million and please carry on the rewarding work. You made some nice points there. I did a search on the theme and found the majority of people will go along with with your blog. I¡¦ve been exploring for a little for any high-quality articles or blog posts in this sort of space . Exploring in Yahoo I ultimately stumbled upon this web site. Reading this information So i am glad to exhibit that I’ve an incredibly good uncanny feeling I discovered exactly what I needed. I such a lot undoubtedly will make sure to don¡¦t overlook this website and provides it a glance regularly. I’ve been exploring for a bit for any high-quality articles or blog posts in this sort of area . Exploring in Yahoo I ultimately stumbled upon this site. Studying this information So i¡¦m happy to exhibit that I have an incredibly good uncanny feeling I found out exactly what I needed. I most no doubt will make certain to do not forget this web site and provides it a look regularly. Hello there, I discovered your blog via Google at the same time as looking for a related subject, your site came up, it seems to be great. I’ve bookmarked it in my google bookmarks.